The only shotgun shack left in town after the developers moved in like hawks and tore down all the old unsightly structures. The Bayer family home is a bastion of old fashion values, and banjo tunes. The classic shotgun shack was a cheap, easy way to build vast lots of homes…now often used as fancy airbnbs, they represent a great icon of the American south. 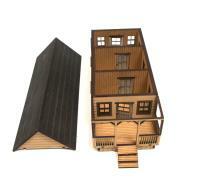 This is a 28mm scale building kit. 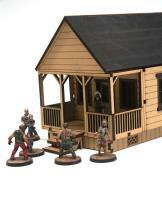 It comes pre-painted on sprues and once assembled its ready to use! 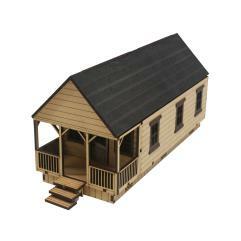 Features working doors and a removable roof! Miniatures are shown for scale purposes only. Model shown is a prototype and some small changes have been made.